Is it really time for a detox? Are detoxes or cleanses necessary and beneficial? Do they suit everyone? Detox is a bit of a buzz word in the wellness industry. The word carries with it the promise to cleanse you from the inside-out, leave you renewed, refreshed, feeling younger, happier, more energetic and a few stone lighter. Who wouldn't want that? But, what does it actually mean and will it deliver what it promises? Living life in this modern world where we are surrounded by pollution in the water we drink, the air we breathe, the food we eat, the clothes we wear and the chemicals we put on our skin; it's hard to escape toxins. Our bodies, when functioning well, can process these toxins and either eliminate them or lock them away somewhere in the body fat so they don't cause us problems. Undoubtedly we all have toxins, but it's whether they are overwhelming our body's own capacity to process them that is the issue. Toxins can disrupt enzyme reactions, block absorption of nutrients, weaken nerves, and distort many body processes. They can even accumulate in the brain and other organs or tissues where they can cause inflammation and worse. However - if you have an unhealthy level of toxicity and this is reflected in the symptoms you are experiencing, then it is vital that you proceed with caution. If your body is being overwhelmed by toxins then it is certainly not ready for a detox, as it shows that your routes of elimination are blocked. What your body needs is help with preparing and toning up the routes of elimination, and improving the digestive process so that you can absorb nutrients and stop consuming toxins through your diet and lifestyle. A body detox takes energy, nutrients and enzymes in abundance and so if the body is already deficient in any of these, the detox may actually do more harm than good. A detox typically involves limiting food types and therefore limiting certain nutrients. Once toxins are pushed out of the tissues and into the blood there's a chance that they will flow around the body and get deposited elsewhere rather than be eliminated. If toxicity is suspected, it's important that you make sure you know what toxins you are dealing with so you can eliminate them safely. For example, heavy metals like mercury can be very destructive to health. A detox takes time, energy, money and support. It's important you ask yourself "do I have these resources in order to do a successful detox?". It is impossible to tell how you will feel and how your body will react, but if you have been assessed properly by a nutritionist you will not be putting your body through anything it cannot cope with. Detox reactions can happen, but ideally they shouldn't. If you do have a detox reaction like flare up of old symptoms, headaches, inflammation etc then your body is not coping with the release of toxins and you should slow down the detox. Often I hear of the suffering people go through when they undertake a juice cleanse without professional guidance, and find they have constipation or diarrhea, their energy levels soar and then crash, they feel starving all the time, their sleep suffers, or they get moody and irritable, and often experience headaches. When they eventually resume normal life, their bodies get stressed all over again as they suddenly have to cope with solid food, caffeine, alcohol and stress! My definition of a detox varies from client to client because I create a unique detox plan that will suit them and their body's needs. I always use live and dry blood analysis as a guide as to whether they need a detox, and what level of detox they can comfortably and successfully complete. Most clients need to prepare the body for several months so that they can really shift the toxins efficiently and painlessly. Why use Blood as a guide? Live and Dry Blood analysis is a useful tool for any nutritionist, naturopath or biological medicine practitioner wanting to get a different perspective of a client's health by viewing a drop of their blood. The blood flows throughout the body connecting all the cells, organs and tissues. It allows the body's different systems to communicate with each other with in-house hormonal and protein signals and messages, in order to maintain optimum health. The blood is actually a biological fluid that contains plasma as well as red and white blood cells. When viewing a drop of live blood (cells are still 'alive' rather than stained and separated) through a darkfield microscope, you can examine the function and viability of the cells and assess the contents of the plasma, the vital nutrient rich medium that feeds the body and removes waste. Add to this analysis the interpretation of the patterns within a drop of dried blood which are created from its elements and residues, and you can build a unique picture of the biological health of a client. It becomes very clear from looking at the blood in this way as to what sort of detox they will need. Heavy metals show up in the dry blood as a very definite indication if present and will need very careful handing in order to remove them safely from the body. If a client's blood indicates a lack of antioxidants, this will be obvious by the viability of the white blood cells as well as the sialic acid residues in the dry blood and will need correcting first. Their dry blood picture may even indicate severe toxic bowel which would mean the routes of elimination need to be opened and supported first. Below is an example of a case history showing blood analysis pictures before, during and after a detox program, tracking the progress and changes that the body goes through, as seen through the blood of a client. This client wanted to do a detox as she felt a bit sluggish. Her diet is a mostly gluten free and dairy free, predominantly organic, meat or fish once a day and loaded with vegetables. She drinks a litre and a half of water, a fresh green juice and one coffee a day. She regularly performs naturopathic techniques such as skin brushing, epsom salt baths and enemas and she exercises regularly. She experiences a cold or cough twice a year on average. She recovered from ME 20 years ago and is prone to migraines, brain fog, candida and chronic fatigue if she doesn't keep on top of her diet and lifestyle regime. She has been under some considerable stress for a few years now and wanted to do a cleanse to help release a sense of being overwhelmed, stuck and carrying some weight that was very stubborn despite her diet and activity levels. Before any detox or dietary advice is given I always take a full case history to flag up any areas of weakness and strengths within the clients health and body systems. That allows me to get a sense of how their body is coping with things like digestion and elimination, how robust their immune system is, and how much energy they have. Importantly it also allows me to identify how much time, support and resources they have available in order to make the changes that may be necessary to their daily habits. Any changes will need to be continued for at least a month (usually longer) in order to get the results they are wanting. I then look at their blood under the microscope to see the effects of their current lifestyle and I look for issues such as possible nutrient deficiencies, signs of toxicity, how stress is affecting them, inflammation and allergy response and to see how deep their symptoms go - are they superficial and transitory (acute) or are they longstanding and underlying all other health issues (chronic). The pre-detox live blood pictures (all pre-detox aged) show corrugated red blood cell membranes with what looks like strings coming off from the membranes. It also shows smaller circles, vesicles, and other shapes with fainter outlines. These are congestive bacterial forms showing a trend towards pathogenic bacterial development - if allowed to continue then it could pave the way for more of the ME symptoms of candida and chronic fatigue. The dry blood picture shows that there are signs of parasites in her system and there are also signs of stress (the round white pin prick holes in the centre of the picture). The larger white shapes in the centre indicate an inflammatory process is occurring. There is also a darker patch of blood right in the centre too. This shows that there is an element of bowel toxicity. Considering that this client's diet was generally very good and there didn't seem to be any glaring nutrient deficiencies I felt that she could undertake a colon cleanse. The symptoms of fatigue, stubborn fat, sluggishness and the sense that her old symptoms of chronic fatigue, migraine and brain fog were just lurking ready to pounce if she relaxed her diet, made me confident that not only could her body cope with a cleanse but that she would be able to shift some stagnation and create movement and healing at a deeper level. The detox that I recommended was a Colon Cleansing Kit by Blessed Herbs (click here for a 10% discount on all Blessed Herbs products). It contains a comprehensive booklet with full instructions, questions and answers, and guides for diet and for naturopathic techniques in terms of assisting the detox process. The kit contains a glass shaker jar in which one mixes up the sachets of "toxin remover" which is a mixture of apple pectin and psyllium husk. This is mixed with fresh pressed organic apple juice (that you make yourself). Digestive enzymes are taken to help break down and soften any tough residues in the digestive tract and to ensure movement of contents of the colon. Whilst on this cleanse you consume food in the form of liquid rather than solid - fresh juices, vegetable broths, coconut water, herbal teas and plenty of water alongside the regular shaker jars of the toxin remover ensure that you do not get hungry. This program can vary in length depending on your choice of detox intensity. In this client's case it was completed in seven days. The colon is the place where we absorb water and eliminate waste. It is also a place where bacteria colonise and proliferate in huge numbers. If the colon doesn't work properly, or efficiently - which can happen for many reasons such diet, stress etc - then we accumulate waste and unfriendly bacteria and parasites. Making this part of your body work better will make a huge difference to your health. After my client had completed the cleanse, I wanted to check her blood to see if there were any changes. There was a huge difference in the red blood cell membranes and a reduction of the congestive bacterial activity on the membranes and in the plasma too. I also noticed that the white blood cells, the body's immune cells, were very active and I witnessed them moving around the blood chasing and engulfing bacteria. All of these changes were positive. I then looked at the dry blood and could see that there was increased evidence of parasites. This did not surprise me because the colon cleanse would have cleared away a lot of matter that provides a home and food for them. The colon cleanse will also have an effect on the tissues too, as clearing the routes of elimination allows the body to push out more toxicity from other tissues. 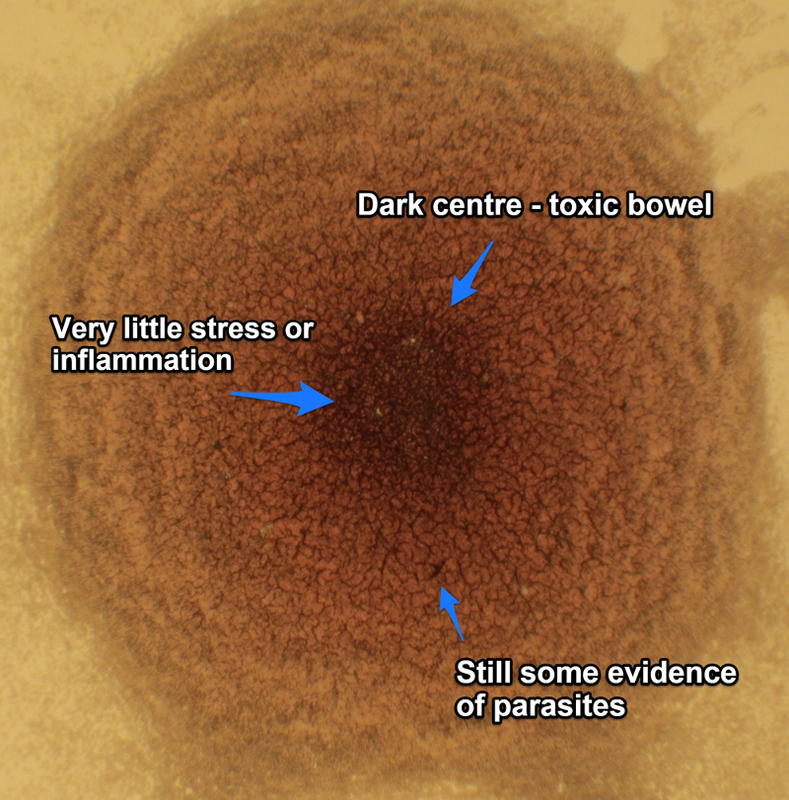 Parasites can live anywhere in the body, depending on which type they are, but they are rarely in the blood itself. What we see in the dry blood are the by-products of their life cycle, their waste and their debris from dying. This showed that the colon cleanse was working, however it created a release of toxicity that the body still needed to be supported in continuing to eliminate. Otherwise the danger was that this newly released toxicity would settle in the body rather than be ushered out of it. I advised that she continue the cleanse but added in herbs for treating parasites. After two weeks of conducting a colon cleanse and parasite cleanse, my client reported a sense of clarity in her mind, she had more concentration and felt very motivated. Physically she felt that she had so much more energy and that she had lost weight. The blood pictures reflected this. 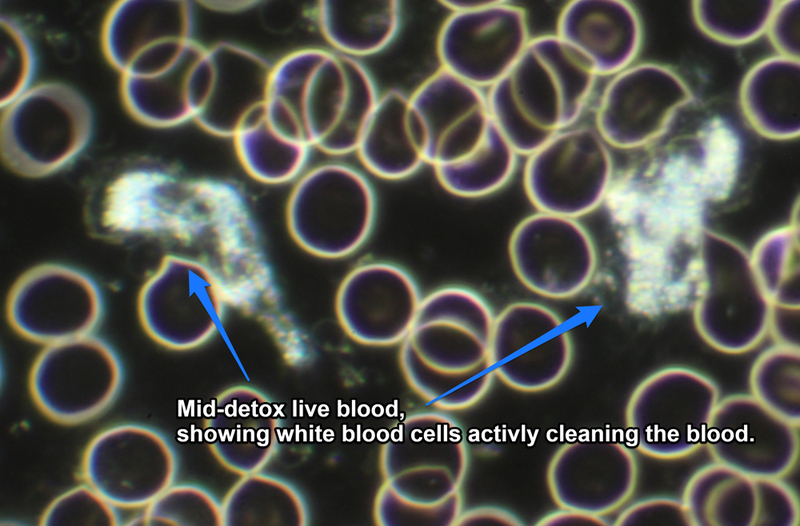 The live blood picture shows really active white blood cells; a sign of a healthy immune system and a reflection on health and vitality in general. The aged blood picture is vastly different to the pre-detox picture - this shows how the cleanse changed the internal environment. The fluid around all the cells has been changed and no longer supports "bad" bacteria. The red blood cell membranes look stronger and the plasma is clear of debris. The dry blood pictures throughout the detox process tell a story of the toxicity being processed by the body. The final picture shows less stress, no inflammation or parasites but it does show heavier bowel toxicity which makes sense, as in order to cleanse and release toxicity it has to exit the body and the bowels are the primary channel! I advised my client to keep focused on the fact that her body was still cleansing and so it was important to keep hydrated, keep up the "clean" diet and the naturopathic techniques that supported the release of toxicity. This case history illustrates the importance of understanding the demand that is placed on your body when you ask it to cleanse or detox. The body needs antioxidants, fibre, hydration, rest and time. A five day, seven day, ten day detox doesn't really exist. Once the body is encouraged and supported in releasing toxicity it creates momentum and you want the body to continue until it is completed or else you could be left with more health issues. Using blood analysis is an ideal way to help clients prepare for a cleanse and track the progress to make sure it is followed through.